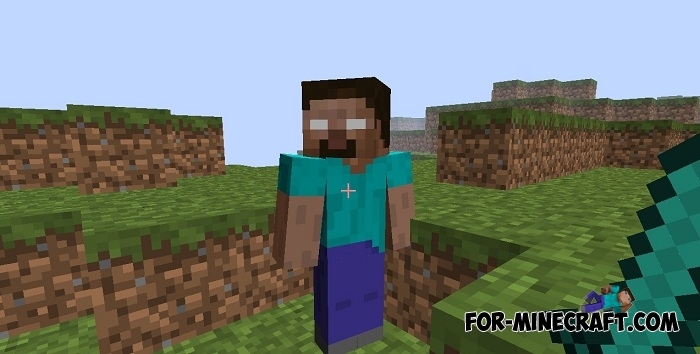 According to rumors, Herobrine is a clone of the player with a slight difference - he has glowing eyes. He walks the world while you are building your house or hunting. Herobrine avoids the player and tries not to come very close, but according to the stories of some players, he can still come up from the back at a time when you are doing something. This addon adds this secretive creature, which is not familiar to all the fans of Minecraft. Herobrine in this addon is not so harmless, he is armed with fireballs, the ability to summon skeletons, teleport and throw TNT at enemies. As you can see, he can stand up for himself. But like any other MCPE addons, there is a drawback that is in the spawn. Herobrine does not know how to spawn on his own, so you need to build a small structure for summoning golems. The appeared character will not wait until you step back and immediately rush into battle. After the spawn, he has only one task to kill you and your friends if you are on the server. Here is one of the latest addons bringing two interesting characters - Herobrine And Notch addon. How to install the Dangerous Herobrine addon?